Is Nonnatus House still in operation? Has the Call the Midwife TV show been cancelled or renewed for an eighth season on PBS? The television vulture is watching all the latest cancellation and renewal news, so this page is the place to track the status of Call the Midwife, season eight. Bookmark it, or subscribe for the latest updates. Remember, the television vulture is watching your shows. Are you? A PBS historical drama based on the memoirs of Jennifer Worth, Call the Midwife stars Jenny Agutter, Judy Parfitt, Helen George, Laura Main, Stephen McGann, Cliff Parisi, Victoria Yeates, Charlotte Ritchie, Linda Bassett, Jennifer Kirby, Annabelle Apsion, and Leonie Elliott. The post-WWII series centers on the midwives and nuns at Nonnatus House, in the Poplar district of London’s East End. In the seventh season, West Indian nurse Lucille Anderson (Elliott) arrives in Poplar. There, she and the rest of the staff must rise to the challenge of helping unmarried mothers, as deal with threats including leprosy, tokophobia, and stroke resulting from Huntington’s chorea. Call the Midwife has been renewed through season 11 on PBS. Season eight debuts March 31, 2019. Stay tuned for further updates. Because American public television is supported by “Viewers like you,” rather than ads, ratings aren’t all that useful a measure for predicting whether PBS will cancel or renew Call the Midwife for season eight. As with many PBS TV series, this is originally a British program. In UK, Call the Midwife was renewed through season nine on BBC One, back in November of 2016. After seven seasons on the air, stateside, its highly unlikely that PBS will drop it, before it ends its natural run. I’m certain enough that PBS will renew it for season eight, that I’m seeking my supper somewhere else. Still, I’ll keep an eye on the trades for any news about this series. Subscribe for free Call the Midwife cancellation or renewal alerts. 3/4/19 update: The Call the Midwife TV show has been renewed through season 11. Find more Call the Midwife TV series news or other PBS TV show news. What do you think? 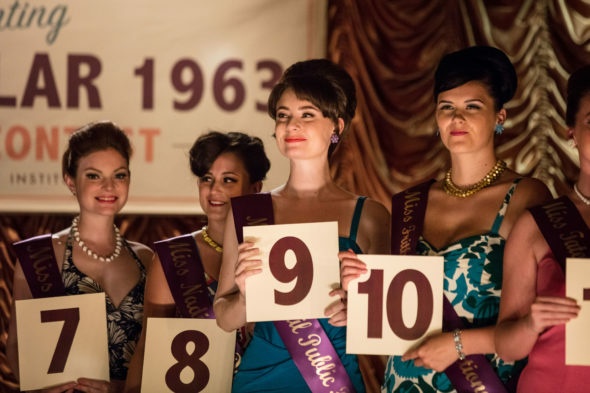 Are you glad that PBS will air season eight of the Call the Midwife? How would you feel if PBS dropped this TV series, instead? More about: Call the Midwife, Call the Midwife: canceled or renewed?, Call the Midwife: ratings, PBS TV shows: canceled or renewed? Please don’t cancel! I love it!! I love it!! Lots more please! Please do not cancel this show, I love it. I think this is my favorite show of All Time! I don’t want it ever to end Please keep it going! BBC already announced that they’ve ordered three more seasons and each one will have a special Christmas Episode, which guarantees the show at least through 2020. Now, I don’t know if PBS has picked up all three seasons. However, you can rest assured that Netflix will air every season. Season Eight has already finished filming. OMG we LOVED LOVED LOVEDD that show its part of why we donate to PBS so HOPING it goes on we even like the after commentary on set nuances!! !